We create custom signs with 5-star results. Design your sign online or let one of our Sign Chefs cook something up for you. Custom signs are one of the best methods for conveying your business information or message in an amazingly original way. Using custom designed signage is pivotal for informing individuals or the general public about your business, events, accomplishments, and other useful information. There are no substitutes for eye-catching signs, banners, and lettering when displaying your brand, important information, or personal message. We offer Wall Signs and Hanging Signs, Decals and Vehicle Graphics, Trade Show and Promotional Items, and so much more! There are countless advantages regarding the usage of custom signs of all sorts. Custom signs in acrylic, aluminum, wood, and other materials are extremely affordable. Compared to other advertising costs like direct mailers, magazines, radio ads, newspapers, internet ads or television, your return on investment with custom signs will be huge. Bringing customers into your business is vital for short and long term growth. Well-designed, optimally-placed custom signage is great for increasing awareness. Use your custom signs for raising brand recognition. A familiar company with a recognizable logo and brand will be chosen time and time again over companies that don't make that effort. Check out our online sign pricing tool to see just how affordable it can be to get your message out with one of our custom signs or posters. Our custom signs provide you with unlimited customization and personalization. We can make you an eye-catching "GRAND OPENING" custom vinyl banner that will excite and interest your customers - don't settle for a bland "grand opening" sign for such an important event. We can make you sturdy, durable outdoor signs that will give you visibility for years - don't waste your time with flimsy signage. With such a wide range options for your custom signs you can expect more exposure, more attention, and plenty of patronage for your business or event. Choosing a made-to-order, custom sign will give a professional, modern, stylish appearance to any business or personal space. Chat with one of our Sign Specialists now. Business Signs Assist in Branding Your Company and Adding to Your Success! Quality business signs and promotional materials a must for the success of both new and established businesses. When you choose attractive, professional, and creative business signs you stand apart from your competition. It's a proven fact that customers are much more likely to support a business that they recognize or know of, so well-placed and effective signage can plant the reminder for future sales. Your outdoor business signs serve as silent sales personnel - working for you 24/7. Creative exterior business signs allow you to identify your services, draw attention to your business, and help separate it from others in the same location. Our dimensional sandblasted signs will help you present an elegant, one-of-a-kind image. Most business signs, whether interior or exterior, serve as a primary link between your business and its customers. The placement and display of business signs is a key strategy when growing a business or brand. Exterior business signs can be ground-mounted or building mounted. They can be temporarily or permanently displayed. With our affordable signs they can even be interchangeable. Signs for your business can be crafted in a huge variety of custom shapes and sizes (acrylic is an excellent material choice if you are looking for a sign in a custom shape) and are extremely effective when displayed near a road or the entrance to your business. This placement attracts the most attention from motorists, foot traffic and potential clients. Remember, business signs are essential to a modern company's complete marketing approach and strategy. Use signs to reinforce your business presence and increase your brand recognition. One simple way to begin branding your company is to incorporate your logo and business name into all of your business signs. Use customized business signs to draw notice and attention to promotions as well as effectively providing information about your company. Real Estate Signs Are the Beginning Steps to Selling Your Property! Eye-catching real estate signs are a necessity for generating interest, calls, and sales for all types of properties. If you are selling your home yourself or have enlisted the help of an agent, real estate signs are required for successful property marketing. Potential buyers visit the neighborhoods they are interested in - strolling or driving through looking for any new homes that have been put up for sale. Placing an informative and engaging sign is key to attracting customers. Locating real estate signs using a frame at the entrance of subdivisions is one of the first steps in marketing your property and letting potential buyers know it's available. Using real estate signs to lead to the property assists your buyers in navigating easily and successfully. These beginning steps are key in getting your potential buyers successfully to the property. Real estate signs need to be noticable, with bold colors and readable lettering, and must include contact information and other pertinent information that may aid in selling the property. The information displayed on your real estate signs is of utmost importance - too much can be confusing and overwhelming too little can discourage buyers from looking further or contacting you about the property. Real estate signs should include the proper phone number, listing number, and, when appropriate, additional property information. Real estate signs that provide the quantity of bedrooms, bathrooms or even the square footage of the property can also be beneficial and helpful. Real estate signs also commonly display "rider" signs. Rider signs are smaller signs attached to your real estate signs, providing additional information, like "City View" or "Must See". Incorporating these eye catching phrases on your real estate signs allow buyers to know some exclusive items or details they will see when viewing the property. Other details that may enhance your property sales include decorative stakes, open house banners, and brochure boxes. Custom signs are your last chance to make a first impression. Successful custom signs are one of the common elements in every successful business or promotion. Well-designed custom signs prominently display confidence and pride. With custom signs you have the ability to differentiate your business or promotion. Custom signs are an extension of your business, so make sure you are putting forth the best possible image. Customers are much more inclined to support places that display professional custom signs over poor quality signage. So take a few minutes to evaluate what kind of impression your current sign makes. Or ask yourself what kind of impression do you want your new custom signs to make? Are you looking for modern or traditional custom signs? Do you want to express yourself or your business with custom signs in a particular shape or size? What about mounting? How would you like your custom signs to be displayed? These are all good questions when you are in the market for custom signs. You may feel overwhelmed but fear not, we are here to help. We can assist you in selecting well-tailored custom signs for all of your personal and professional needs. Custom signs have the ability to be crafted in a large assortment of materials and we offer a huge amount of options for personalizing your signs. In addition, we make pricing your new custom signs fast and convenient. Our new online pricing system enables you to accurately and quickly get a price on all your new custom signs. Big or small, one or many, acrylic or metal or wood - all of these custom signs can be priced right here online. Business Signs are Your Most Affordable and Most Successful Marketing Tool! Business signs are one of the most cost effective advertising campaigns available for companies with limited marketing funds. Our custom signs are available at a much lower cost than radio, television, or newspaper advertising efforts. When it comes to reaching a large consumer audience nothing works better than well-designed and well-placed business signs. Successful business signs are not only found near or directly attached to companies, they can be found off-site too. Strategically placed yard signs, sidewalk signs and even vehicle magnetic signs enable you to convey a concise message to an even larger market. To be a successful business in today's market you can't rely solely on word of mouth. Let our business signs come to the rescue. Use custom signs to work non-stop for you and your business - while not everyone in your target market is in need of your product or service at this precise time, in the future they may be, and an eye-catching, informative sign will help your customers keep you in mind. Signs that present your company's logo, information, and services are exposing your company to new clients on a daily basis, planting or branding your business into their thoughts and memory. Frequently your business signs work subconsciously. Clients may not realize they ever even noticed your business sign, until one day when they need your products or services - and zing! Your customer knows exactly who to contact! They have noticed your business signs, possibly without realizing it, each and every time they drove past it. As they were exposed to your signs your company image became planted deeper and deeper in their memory. Consider the placement of your signs. Business signs near the road are great for attracting new customers. Placing your custom signs at key locations in your store or around your company can generate impulse buys and inform your clients of additional services you offer. Real Estate Signs, and Some Effective Advertising Strategies! Real estate sales depend on projecting an image of quality and compentence. A well-designed real estate sign must provide information about the property and realtor - often at a glance. Including a realtor's photo is an effective way to get the most out of your real estate signs. More often than you know, real estate signs that incorporate images of popular realtors into their design are often contacted merely on the reputation of the realtor. Using custom real estate signs, complete with a professional head-shot of the realtor, placed where they can be seen all over town, conveys to the buyer that this agent is dedicated, successful, popular and may be the right fit for them as they search for property. Reputation can mean a lot in this market so give your clients a good look at the realtor they will be depending on. You may find that your professional-looking, long-lasting, custom-made real estate signs result in a faster and more successful purchase or sale. We offer other products beyond the sign itself that provide additional advertising strategies to secure a sale. Real estate signs can also be designed to include a brochure box. Providing flyers on your custom signs can assist you in narrowing in on the perfect qualified buyer for a property. Our hanging and mounting accessiories can dress up the look of your sign - giving it a more elegant feel. Custom riders attached to the sign can give potential clients more information about the property with a quick glance. The important thing to remember is that real estate signs are the first thing a potential buyer sees. Use professional, sharp-looking, and informative real estate signs to attract individuals to your property. As you bring in more and more customers you will see how effective your real estate signs were in closing that sale. Learn all about ordering your own custom signs. Find out which business and real estate signs are best for you. We are a sign company here to help you design and order all your custom signs. We offer a variety of sign materials and templates to meet your specific application - including many types of business signs and real estate signs. At The Sign Chef we pride ourselves on creating a quality product, with unmatched professionalism and prompt delivery. Your new made-to-order sign will arrive exactly how you designed it - ready to install with ease and confidence. "Custom Signs" are any of the exceedingly large assortment of signs and sign products we offer, personalized by you and custom-made by us. Any type or range of custom signs can be produced to meet your exact business and personal needs. Business signs, real estate signs, acrylic signs, plastic signs, metal signs, posters, decals, trade show products, engraved items and so many more options are available for your custom signs. Design options for your custom signs are limitless. They can range from simple, minimal layouts, to vivid, full-color, photo-based designs. We offer all our clients a variety of options when it comes to designing your custom signs, regardless of size or application. Personalizing a custom sign is now completely affordable for businesses both large and small. Since we offer such a large variety of signage options, anything from custom real estate signs to church banners, you are guaranteed to find the perfect custom sign to suit your needs. In fact we offer just about every kind of custom and business signs imaginable, except billboards. Your custom sign orders ship daily right here from our facility, in Charleston, South Carolina. We are proud to be a USA based company and we support other USA companies and manufacturers. "Are custom signs really cost effective?" Modern technology has made custom signs affordable for all businesses, large and small. All of your custom signage (business signs, banners, decals, window graphics, and more) work together like a united sales team. They are out there, working hard, promoting your business or organization 24 hours a day, 7 days a week, 365 days a year. Since all custom signs, including our business signs and real estate signs, actively do their job for years; the cost of advertising per business impression is considerably less than other advertising methods. Other advertising methods require monthly capital investments, all without the advantage of ownership. Custom signs are a wise and profitable investment in the present and future of your company or organization. With a simple calculation, you can see the return on investment from custom signs, and how they pay for themselves time and time again. "How do I choose the most effective business signs for my company?" Do you need a custom sign for advertising your business, as an informational sign, or to direct traffic flow? Will these custom signs or business signs be temporary or permanent? Where will you display and mount these custom signs or custom banners? Inside or outside? Will you be placing graphics or lettering on a car, truck, van, boat, or motorcylce? What is your target audience? Who do you want to see your business signs? How much time will your target audience have to view your custom signs? How will you install these custom signs? From what distance would you like these custom signs viewed from? When starting with these few basic questions, and accessing our information provided on this site, you can easily match the characteristics of our sign materials and select the perfect material for your custom signs. If you need any help we are just a phone call (1-800-899-6272) or e-mail away. "Can custom signs create top-of-mind brand awareness for my small business?" Eye catching, well-designed, attractive custom signs will absolutely assist in branding a small business and its location, just as any label promotes its brands on particular products in the grocery store. To be a successful business or organization it's important to incorporate custom signage (business signs, vinyl banners, magnetic vehicle signs, and other pieces) into your marketing efforts. This advertising reinforces the image of your company and its location. Custom business signs featuring your logo and other important information creates top-of-the-mind awareness with potential clients. By using your new signs to visually brand your business image into the minds of customers and potential clients, you are subconsciously reinforcing a memory for the particular products and services you offer. When this audience is in need of your services they are much more likely to remember your company and your business signs. Branding your business or organization doesn't just pertain to custom signs and business signs, but can also apply to custom vinyl letters and custom decals applied to your company vehicles, storefront windows and many more applications. We offer a large range of products to brand your business, all of which can complement your tailor-made business signs. "Why should no business be without custom signs?" Without the correct custom signs a business cannot survive or prosper. With the proper business signs a company can reach and even exceed its economic potential. Attractive custom signs can be a visual asset to your company and increase your opportunity for success. In addition, business signs are one of the most cost effective methods of promoting and advertising your company. Eye catching, visible custom signs are well received in business locations with large amount of traffic. Custom signs act as sales personnel - introducing your company, promoting products and services to first time clients and customers. Business signs are always working. They never take a day off or call in sick. They make thousands of impressions daily to draw new clients in and keep current customers excited. According to United States Census findings, 18% of all households are relocating each year. So as your customers are moving out of the area, it's necessary to have effective custom signs in order to expose your company to the new clientele. This is especially important if your company has products or services to for movers and homebuyers - such as real estate offices. Custom signs allow you to make your company's branding more pervasive and can even encourage individuals to change their buying habits. "How can I get a professional looking design online for my custom signs, without paying a dime?" We offer 2 methods for you to create professional, personalized custom signs right here online! First, we provide you with free, unlimited access to our SignMagic Online Design Center. Take all the time you need to design, create, edit, and tweak all your own designs, all on your own time. Whether you need it after hours or on the weekend, your access to SignMagic is always there - 24 hours a day. Save your designs as you work and they are always available for you to edit, order or even re-order. With SignMagic you are not limited to just designing. Once you create a design, you can immediately view prices online for all of your custom signage - business signs, real estate signs, plastic and acrylic signs, metal signs, wood signs, promotional products, banners, decals, or window graphics. Instant pricing allows you to compare material to material, enabling you to select the custom signs that are right for you and your business or organization. Second, check out our Live Design ™ Software. With this software we can create, edit, and design from scratch your custom signs while you watch - live. We simply email you a password which grants you access to view our graphic department's computer screens. You are able to watch in real time, as if you were seated right next to your very own graphic designers. As your custom signs, business signs or other sign related images begin to take shape, you can speak directly to the graphic designer by phone and provide instant feedback, request and express design ideas. This is a totally free service - available with no charge! And, even better, with no obligation to buy. Just another advantage of working with us as your custom online sign company. If you already have the perfect design or artwork for you custom sign, you can simply upload or email it via our website. Our art department will then review your artwork making sure it's perfect before processing. And in either case, you will be emailed a proof of the artwork for your approval before production begins to ensure that you are happy with the finished product. "Where can I find sign prices online for custom signs?" Pricing custom signs for your business can be tough online. Often our customers just want to know what options are available and at what prices even before they begin to design. However, many other companies are reluctant to show their prices online. That is why we have made prices for our line of custom signs available online instantly and easily. With our Online Pricing System you can get an accurate price for all your sign needs. Find the price for the signs to fit all your business needs - we've got metal and acrylic signs; custom vinyl banners; posters; vinyl letters for windows, boats, and other vehicles; real estate signs and oh, so much more, right here online with our easy to navigate Online Pricing System. In addition, as a full service custom sign company, we can provide even more options for custom signs - offline. So if you have questions about an idea for a custom sign that you don't see online or if you would like to know more about the materials they are crafted from, we can provide you with a Quick Quote within hours - simply give our Sign Chefs a call at 1-800-899-6272. We will also assist you in getting the most return on your custom signs as an investment. "How fast can you ship my custom signs?" Normally, for custom signs our turnaround time is 24-48 hours to ship. This time may be adjusted for custom sign orders with a quantity of 25 or more, or for signs that need to be produced in multiple panels. As an option we do offer Overnight, 2nd Day Air or 3 Day Select, if you need express shipping on your custom signs. The key to receiving your custom signs quickly is the proofing process. As soon as you reply to our proofing email either with an approval or with edits, the quicker your custom signs will be moved to production. If you are as quick to reply to your proof as we are sending it to you, then you will be receiving your custom signs in record time. "What are my payment options when it comes to custom signs?" We accept popular credit cards like Visa, MasterCard, Discover & American Express. We can also accept checks electronically by FAX and by phone! In fact, you don't even have to mail the original. Faster than snail mail, e-check is a convenient option to expedite your order. Invoicing / Terms - While cash flow is important to every small business, we can provide payment terms to Government Agencies, the Military, Public Schools, Libraries, Universities, Hospitals and Municipalities. "What kinds of custom signs and business signs does your sign shop offer?" For a full list of sign products and additional information, be sure to check out our Sitemap. "What are the most popular types of Business Signs?" Acrylic signs are one of our most popular choices for business signs. Its rich, corporate, sleek, contemporary look commands attention, giving your business the exposure it deserves. Acrylic business signs, with their flamed polished edges have the appearance of heavy glass, without the cost and difficult installation. Unlike glass, our acrylic business signs can be custom cut to any shape or size to accommodate your business needs. When you require a professional, sophisticated business image, acrylic signs are the ideal choice for your business signs. The benefit of using a custom sign company is the variety of options when it comes to customizing your business signs. We can precisely cut acrylic into any shape, using our laser. In addition, the laser can permanently etch your business logo or company message into the plastic itself. Depending on the image you desire, this etching can be on the front or back of your acrylic business signs. Acrylic is commonly used for interior business signs, but can also be an option for exterior signage as well. Plastic acrylic is often used to produce outdoor lighted sign panels. However, when you require high impact sign panels we suggest our Acrysteel or Lexan brand plastic sign panels. Replacement plastic sign faces are readily available in a variety of sizes, shapes and colors. Replacement sign faces are usually slide into the end of a lighted sign cabinet. These replacement sign faces are crafted differently than other plastic signs, in order to insure the lettering and graphics are properly displayed at night. Flat panel replacement sign panels are the most affordable, therefore usually the most common choice for business signs. However for a more expensive, custom sign panel appearance, our clients request molded plastic sign faces. These molded plastic sign faces can be designed with either flat lettering or embossed (raised) lettering. In addition to a more professional look, molded plastic sign faces are easier to install and have blow out resistance. Because molded sign faces give your business signs structure, the panels won't bend, flop or bow like large flat sign panels can. When you requir replacement sign panels 4'x8' or larger, structure is important. The larger your replacement signs panels are the more structure it should have, making molded sign panels the perfect choice. We are here to assist in making sure you select the correct sign panels for your business signs, regardless of size or price. Aluminum is probably one of the most popular and versatile choices when it comes to business signs. 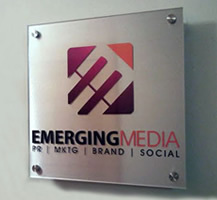 With aluminum, your business signs are available in virtually any shape, color, size and thickness. When your company is in need of large, rigid seamless business signs, aluminum signs are even available in sheets up to 6' tall and 12' wide. Aluminum's lightweight but rigid attributes make it an ideal sign material for a large assortment of applications, both indoors and outdoors. For small interior business signs to jumbo-size exterior business signs, aluminum can accommodate any size, style or climate application. Because metal business signs are produced from anodized aluminum, they are rust-proof, resistant to chemicals and can weather most elements. In fact, aluminum signage is often requested by government agencies for harsh, salt-water and marine applications. When a thicker "beefy" appearance is required for your business signs, check out ARMOUR-Wood, alumalite or dibond. 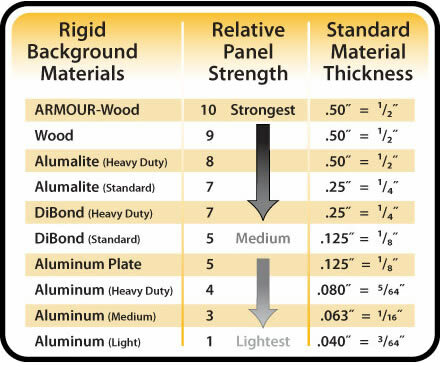 Below is a breakdown of sign materials and their strength ratings. We are always here to assist you with any questions. The use of banners as business signs, whether permanent or temporary, has exploded recently. Advanced modern printing techniques allow us to produce banners with quality, corporate imagery at great prices. And since banners are available in any size, style or color, they are a low cost way to communicate your business message and attract attention. Banners are not just for business signs either. On a daily basis we produce church banners, hanging banners, school banners, and banners for non-profit agencies. Because vinyl banners are affordable they are perfect for just about any company or organization. A banner is a great choice for special occasions and events because they can come in any design you can imagine and banners don't require permanant installation. We offer you the option of single or double side banners, as well as the option of street banners, trade show banners and many other custom banner options. 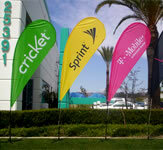 In addition we offer a variety of options for displaying your banner business signs. Retractable banner stands are one of the most popular and professional options when it comes to promoting your business. For an easy and quick installation we also can offer you a variety of finishing options for your vinyl banners. These options allow you to install your banners instantly and professionally. Trade show banners are an eye catching way to bring exposure to your business. We offer a large assortment of trade show banner options as well as many professsional setups and accessories. Creating a mobile message for your business is easy with vinyl lettering and graphics. By customizing your company fleet with your business name and graphics, you are branding your business in your local market. With SignMagic, our design software, you can design and price your own vinyl lettering and graphics right here online. If you would like, as an added option we can actually design your vehicle lettering and graphics while you watch, live. After you have received the design that accurately and professionally represents your company you can get a complete price for your entire vinyl graphics package. And remember, there's no obligation to purchase, ever! Our vinyl lettering and graphic packages are an easy do-it-yourself installation, saving you the expense of hiring an installer. With application of lettering on the body, tailgate and even the windows of your company vehicles your lettering and graphics will have a professional appearance and will in effect looked painted on. And when it's time to sell that vehicle, fear not, vinyl letters are easily removed without damaging your vehicle's finish. In addition to installation instructions that are included with every vinyl lettering package we also have produced our very own series of installation videos. These videos will assist you in applying your vinyl lettering and graphics to a variety of vehicles and surfaces. Vinyl lettering is affordable, practical and easy to install on a variety of vehicles. 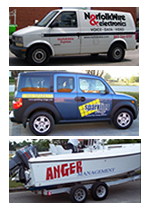 Use vinyl lettering and graphics on your van, car, trailer, motorcycle or even your boat. Real estate signs will always be a vital asset, whether the market is growing, holding steady or declining. Readily visible, eye-catching real estate signs are the first step in reaching out to potential buyers. There are quite a few options to choose from when selecting your real estate signs. We will address a few of them below. Aluminum real estate signs are still quite popular with realtors. These real estate signs provide a premium, professional look and are easily customized. We carry a large selection of real estate frames for displaying and mounting your custom real estate signs. 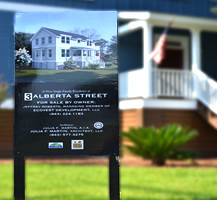 For a low cost alternative, real estate signs crafted from coroplast are available. Coroplast also known as "plastic cardboard" can be seen everywhere from real estate signs, to yard sale signs, to property for rent signs. Wire stakes, sidewalk frames, posts, and L-stakes are available to prominently display your made-to-order real estate signs. On those occasions when you are in need of large site signs, construction signs, or commercial real estate signs, we suggest a studier material for your signage, like Dura-Wood, ARMOUR-Wood or alumalite. These durable, waterproof sign materials are ideal for large outdoor real estate signs. Magnetic Sign material is still the only practical option when you need removable and re-usable Vehicle Signage. Although Magnetic Car Signs (also known as Magnetics) are the most common, Magnetic Truck Signs & Magnetic Van Signs remain popular due to their low prices. Of course, properly sized magnetic signage can be used on virtually any other type of vehicle as well. Premium grade, full-color Magnet Signs allow for unlimited design flexibility to support your local branding strategies. Magnetic Business Signs effectively "geo-target" potential clients close to your business. In other words, the people in your local geographical area will repeatedly see your message displayed on your car's Magnetic Sign, creating even greater name recognition with every mile you drive! Wooden Letters — Offer a nostalgic appeal. Wood letters have decreased some in popularity as plastic letters have become more durable and affordable but wood letters still offer a timeless, classic look and feel. Molded Plastic Letters—Can be customized up to a 2" thickness. You can also choose extremely flat plastic 3-D letters, from 1/8" to1/2" depending on style and size. Metal Logos and Custom Metal Letters— These high-end letters provide the highest quality business image compared to any other 3D letter option. Available in solid brass metal letters, stainless steel letters and raised aluminum letters - with our wide range of mounting options these 3D letters make great corporate business signs. Super Smooth Gator Foam Letters— Perfect for use when you need a lightweight, low cost, dimensional signage option. 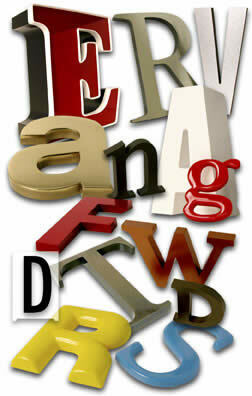 Hybrid Letters include Metal Plated Foam Letters— Make an excellent alternative to solid metal letters. Presenting a high-end appearance at a low price point. Lighted Channel Letters— When your business sign requires visibility 24 hours a day these lighted channel letters make by far the best choice. All the hardware and installation templates are include with your 3D letter order. Installation is easy and can be done yourself (or by someone handy). Simply tape the factory supplied template to your mounting surface, measure to make sure it's straight and level. The template will show you the precise placement of your custom dimensional letters and the mounting locations. This is the exact same method used by in-house professional sign installers. Vinyl letters are one of the most versatile business signs you can implement into your advertising strategy. Applying lettering to your windows is a professional way to display important information. With vinyl letters you can create branding, increase sales, or simply display your hours of operation. Vinyl letters provide you unlimited flexibility. We provide you not only with our Vinyl Magic Application Kit, but with access to our very own produced installation videos. These videos will assist you in your do-it-yourself application of your vinyl letters. "What are the best types of signage or graphics to use when designing custom signs?" From the Desk of Tim Harrelson - Founder and "Hands-On CEO"
Are you still trying to figure out the best type of signage or graphics to use, all by yourself? Do you even know what your options are? Unfortunately, reaching the right sign decisions on your own can be time consuming and difficult. And if you don't take certain precautions, you could end up making a costly mistake. So where do you start? Your advertising message should connect with the people whose attention you most want to attract and impress. Who is your perfect customer? What problem does your company solve for them? What your message says is critically important. It's not just what you say though, it's how you say it. 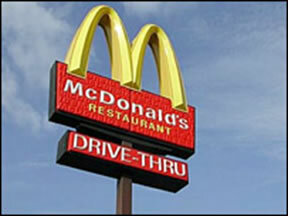 Do you think McDonald's would have become the icon it is today with just these plain, boring words? Just look at the difference! The most recognized sign in the world! Ahhhhh … those golden arches! By following the right design principles, any small business can become a well known icon in their local business community. Want a more down-to-earth example of how a simple design can dramatically affect public perception? Let's look at our very own business sign as a case in point. In discussions with clients, they often assume we are this huge company or part of a national sign franchise due to the appearance of our name and logo. However, we are a classic example of "Small Business America". No, we're not a franchise. With 15 employees, we're certainly not huge either (in fact, don't be surprised if you catch me answering your call). But the professional looking image of our sign automatically attracts new clients day after day. And if you make all the right decisions, your new business signage can do the same for you too! What is the best way to get your other sign questions answered? We offer a variety of options when it comes to communicating with us about your custom signs. It's up to you as to which options suits your needs. Live Chat allows you to instantly chat with one of our LIVE customer service specialist. The channel is secure and private and one of the quickest ways to get your custom signs, real estate signs, business signs or other sign related questions answered. 1-800-899-6272 - The telephone is perfect for those who prefer the speed of a regular conversation over typing. Our e-mail address is monitored 24 hours a day. Free Quote – Need a particular type of sign you don't see on our web site? As a Complete Business Image and Identity Store, we provide our clients with hundreds of different types of signs and related services. So if you need anything custom, we would love to have the opportunity to provide a free quote for your custom sign. The more unusual, the better! "When my local sign shop dropped the ball, I couldn't believe I was actually able to find somebody open on a Sunday to help me out of a jam!" With my big event a week away, I had placed my order for some full-color vinyl banners with another sign company. They promised me the vinyl banners would be ready to pick up on Saturday. But when I called, all I got was voice mail. So I decided to drive on over to see what was going on. The sign business was closed, just as I suspected. Talk about mad! I was furious because these custom banner signs were an essential part of our big event on Monday night and they knew it! Unfortunately, everyone else I tried in the phone book was closed too. I was starting to run out of time! The only other option I could think of was to search the internet and see if I could find someone to help me. 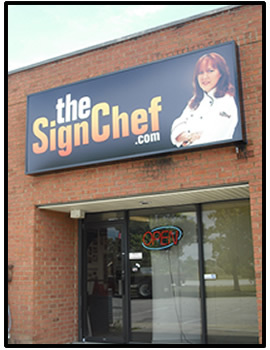 When I found TheSignChef.com, I was just sitting there scanning the website when Tim popped up on live chat and asked me if I had any questions. When I told Tim what I needed, he came up with a great idea. Not only would he get all three digital banners printed for me, he could put them on a Greyhound Bus for morning delivery since all the other carriers were closed on Sunday. That was at 3:03 pm. Within five hours, Tim called to tell me my custom banners were printed, packaged and on the bus. And my event? It was a huge success due in no small part to Tim and his team at TheSignChef.com. I couldn't have been happier with how my custom banner signs turned out. The quality and colors were perfect. All this, and I didn't even have to pay a rush charge. With customer service this good on the weekend, TheSignChef.com must spoil their other clients rotten during the week! "How can I attract customers outside of my local region?" It is estimated that 33%-50% of customers shop outside of their immediate local area. Highly visible custom business signs will help draw a significant number of these mobile consumers to Stop, Shop and Buy. Attractive and noteworthy signage will stay in the brains of people who see it - even if they are only tourists in your area! Custom lettering or decals on your vehicles (cars, trucks, vans, motorcycles, even boats!!) can attract customers while your are driving around in or out of town. "What if I need my new signs FAST?" Custom signs of all kinds are our speciality - business signs, real estate signs, trade show posters, acrylic signs, metal signs, wood signs, 3-D letters, vinyl banners, vinyl letters, vinyl graphics, and so much more! We are a custom sign manufacturer, proudly based in Charleston, SC. We offer a variety of shipping methods and we can arrange for extra quick production on your order if necessary. If you need your next custom sign order in a rush please give our office a call at 1-800-899-6272. Alabama AL, Alaska AK, Arizona AZ, Arkansas, AR, California CA, Colorado CO, Connecticut CT, Delaware DE, Florida FL, Georgia GA, Hawaii HI, Idaho ID, Illinois IL, Indiana IN, Iowa IA, Kansas KS, Kentucky KY, Louisiana LA, Maine ME, Maryland MD, Massachusetts MA, Michigan MI, Minnesota MN, Mississippi MS, Missouri MO, Montana MT, Nebraska NE, Nevada NV, New Hampshire NH, New Jersey NJ, New Mexico NM, New York NY, North Carolina NC, North Dakota ND, Ohio OH, Oklahoma OK, Oregon OR, Pennsylvania PA, Rhode Island RI, South Carolina SC, South Dakota SD, Tennessee TN, Texas TX, Utah UT, Vermont VT, Virginia VA, Washington WA, Washington DC, West Virginia WV, Wisconsin WI and Wyoming WY. Five of our top spots for custom business signs are in California, New York, Texas, Florida and the New England Area. In California, Los Angeles, San Diego, San Jose, San Francisco, Long Beach, Fresno, Sacramento, Oakland, Santa Ana and Anaheim are among the most popular areas. In New York we have hundreds of clients who have purchased custom signs and vinyl banners from New York City, Buffalo, Rochester, Yonkers, Syracuse, Albany, New Rochelle, Mount Vernon and Utica. Texas is in a very close race with California and New York as one of our top states for custom real estate signs and vinyl church banners with the most popular cities including Houston, Dallas, San Antonia, Austin, El Paso, Forth Worth, Arlington, Corpus Christi, Plano and Garland. On the east coast, Florida is truly a hot spot for custom real estate signs, plastic signs and promotional vinyl banners with customers in cities including Jacksonville, Miami, Tampa, Sarasota, Saint Petersburg, Hialeah, Orlando, Fort Lauderdale, Tallahassee, Hollywood and Pembroke Pines.